Report: Condensator installed, works great, results and pics. I can't see your vendor forum. Ford didn't make a P71 in 1988. Having seen just about all the "fuel saving" devices that have been around since the Fifties (that's 1950's), I have found only one that ever had a beneficial effect. It was manufactured locally here in NJ, and, because it's carb'ed based, can't be used on modern day cars. It was basically a Ni-Cad series of mesh screens and had an electrolyte pressed into the carb base gasket connecting to the Ni_Cad screens that hung underneath the throttle plates. What it did was to make the gasoline charge more negative with respect to the block. It was basically a catalytic device. The net effect of the Ni-Cad screens was to increase mileage by anywhere from 10 to 25%. I was more than pleased with the results, since my cars of the time (in the '70's and 80's) were real gas guzzlers. Most of you know, I'm sure, that the ignition spark output is negative going with respect to the engine block. This was a phenomenon found in the early days of car-dom, and it affects gas mileage significantly. What this device did was to enhance the effect. Even as late as the 1970's, Mobil (now Exxon/Mobil) was studying these effects for the car manufacturers. Can this same "effect" be used today? In theory - yes. In practice - no. It's very hard to impart a different voltage charge on the current systems of fuel injection. Besides, electronics has more than made up for this method. As for the PCV gas separater discussed in this thread, notice it uses a "catalytic" separater to do the dirty work. From what I see, it's possible to impart a differential charge to the separated gas that is returned to be re-burned. Therefor, by dumb luck, there might be an increase in gas mileage - and not necessarily for the reasons given by the manufacturer. On the other hand, if one uses Mobil 1 or another good synthetic oil in the crankcase, it has been shown that blow-by emissions are reduced significantly. Synthetic oil doesn't burn and produce vapors when left on cylinder walls. It is possible to pull in oil through leaky valve stem seals, but this generally exits primarily through the exhaust system. I could see this device being basically useless when used with synthetic oils in the crankcase. The rest of you basically have called it for what it is. I wouldn't say that it absolutely didn't have some effect, but I would say it would be minimal. Having seen just about all the "fuel saving" devices that have been around since the Fifties (that's 1950's), I have found only one that ever had a beneficial effect. Did you ever test the Condensator? Glad it works for you. There have been many changes in automotive technology from 1995 to 2003. Please do a real-world test with it installed on your MM and let us know what your gains are. I also need to know if this would violate the federal laws regarding monkeying around with the pollution control system. Can our legal dept comment on that? Built-in Nav, Bluetooth, USB port, aux/ipod jack, ]2 power ports and Sunroof! six speed auto trans w/ Sportmatic, dead pedal, rear-view camera. Voice cmd for radio, sat, nav, cell phone and MP3. Four very muscular, steroid-enhanced, genetically mutated, Mountain Dew injected, wild racing hamsters cavorting under the hood. Many of us use an air/oil separator in our PCV system to keep gunk out of the SC and IC. It looks like any other air/oil separator out there with the exception of a larger bowl and different kind of filter. It's the 'hype' that's freaking everyone out. It's true that oil will reduce your octane through the PCV. This is another reason I chose to add and air/oil separator. It's kinda pricey for 179, considering you can get a Moroso for 100, a Jeg's for 50 and make one yourself for about 30. The idea is sound. The hype is too much but it seems it WOULD do it's job. Fuel savings? I dunno. Cleaner engine and less octane loss due to junk, I believe it. Would I buy it? Nope. Made my own. Thanx, though for bringing it to our attention. I too, am sick and tired of the 'dogpile' mentality when a member brings us another option! I made my own also, Rich. The desiccant beads make me re-think my design, though. Perhaps I'll add this to my winter project list.... it's getting long. 1995 Schwinn High Plains 21 speed, custom gearing. I agree. After reading the site carefully, it seems the desiccant is the key. Otherwise, it appears it's just like any other separator. 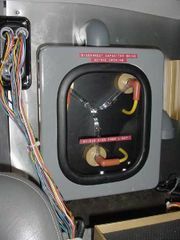 There is a device called a "Flux Capacitor" that will run your car on almost any organic compound, even banana peels!! It can be installed in any automobile, but is still experimental!!! The Big Three car manufacturers and the Big Oil companies are trying to stop it!!!! It was featured in a Hollywood movie, and will probably be available in the near future, just in time to save the planet, and save America from foreign oil dependance, too!!!!! The more I learn, the more I find out I don't know. Since there is a desiccant involved is there a warning to not eat the desiccant? is to kill them, keep on killing them, until you kill the last one, then you kill his pet goat." "I come in peace. I didn't bring artillery. But I'm pleading with you, with tears in my eyes, if you **** with me, I'll kill you all"
I have a friend that has been making these for several years and he use bronze wool as the media and it works just fine!!! Clean it at normal oil changes and keep going!!! any organic compound, even banana peels!! That was 'Mr Fusion'. Good grief, if your gonna be a smart azz, at least get it right!!!! Re-read my post. Gas savings? Dunno. But I do believe it keeps gunk out of the motor. Why else would performance shops offer a separator? BTW, it's VERY common in piston-powered aviation to have an air/oil separator. I agree they could me made for next to nothing on a massive scale. What if they were suddenly required on all cars? How many engines would be shot from people not emptying the can and sucking straight used oil into their intake plenum? I don't think it's a reluctance to save gas or prolong engine life. I think it's a reluctance to replace motors due to owner stupidity. Yep, aviation commonly uses stainless steel wool. All it does is give the vapors a place to 'condense' and then drip into a catch can rather than go into the motor. Everyone has called it what it is? Man, that's too much. You and everyone else that has piled on haven't even TRIED one, and you have it all figured out? Nonsense. I shouldn't be too hard on you, though. At least you admit that there is a device that could generate a 10-25% improvement in fuel economy. But be warned: If you try one on your car, and it works, don't start a thread about it here, unless you want to be at the bottom of a pig pile! I must say, though, about your device, to state that the ONLY devices likely to work must rely on the charge differential technique you mention seems a little bit narrow. The internal combustion engine has many systems, that employ countless principles, the possibility that there is ONLY ONE WAY to improve on it is patently absurd. Thanks, ckadiddle for the suggestion. For all the cynics, and smart asses here I've decided to do just that (present company excluded, of course. As for engine technology changing a lot from 1995 to 2003, I'm not sure. The mod motor in my 95 P-71 is almost identical to the one in a 2003 P-71. Very few improvements, really. The biggest one is better cylinder heads. The Condensator is CARB certified for emissions in CALIFORNIA. It reduces emissions, and will not violate federal law. Trust me, with the kinds of mods being performed at this forum, the last one you have to worry about getting in trouble for is the Condensator. It is evident that silica gel serves as a catalyst, adsorbant and separator, where the adsorbant qualities are described as a “condensing” property. The “condensing” mechanism is actually one of electrovalent attraction as opposed to simple condensation. It is empirically assumed that the lighter solvents extracted from the mass are passed back into the airflow separate from the mass. This accounts also for visual cleanliness of the catalyst (silica gel) after 30,000 miles of operation. Silica Gel seems to be the ideal material to perform this function. Steel or bronze wool DO NOT have the same chemical, physical or electronic properties, much less the same surface area. Ha Ha. Not necessarily and yes - in that order. I have a friend who worked for NASA back in the 1960s, and specifically worked on the Apollo program. He said when he graduated from MIT, his class mate decided to work for Ford, and tried to convince him to, also. 'You have to come to work at Ford!' He went on: 'You won't believe all the ideas they are working on. The stuff is just amazing!' However, after careful consideration, my friend, decided to work at NASA. The years went by, and after he had helped to put a man on the moon, he one day saw his friend, again. He was deflated. 'Not even one of the ideas we developed at Ford was ever implemented', he stated. If we ran the companies, I bet cars would be A LOT different today. Did you mean "Ephraim’s Inorganic Chemistry"?